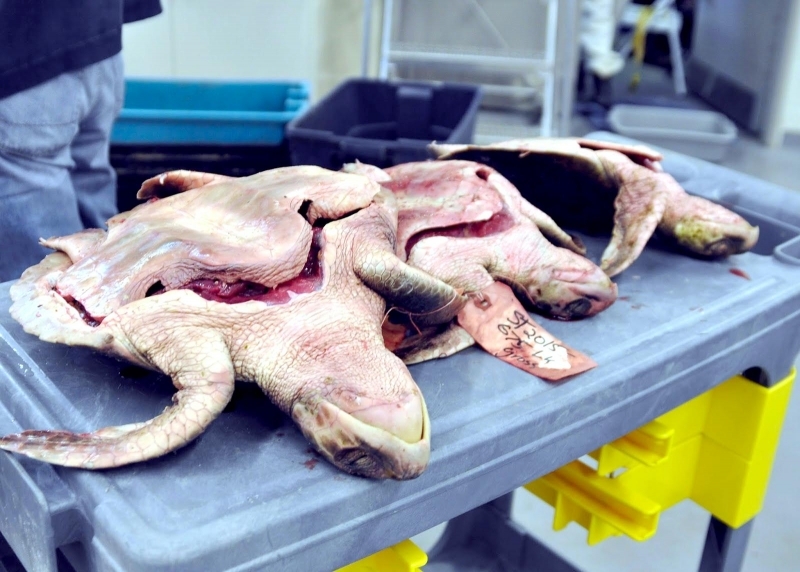 Necropsies are the dissection of a dead animal to determine the cause of death where an autopsy is performed on a human for the same purpose. 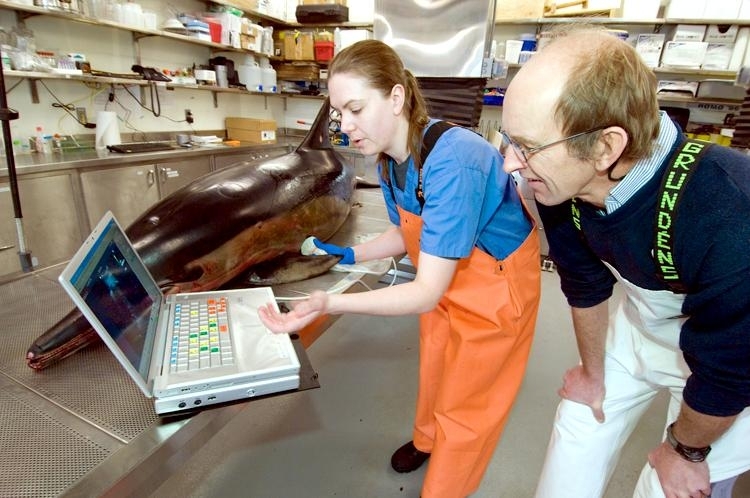 Necropsies can help us learn more about the biology of an animal, how it is affected by disease or how human interactions may impact animals. 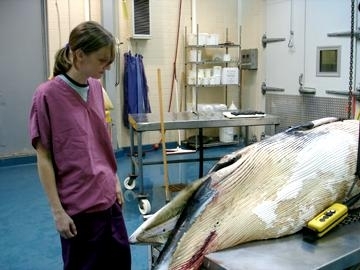 Veterinarians regularly perform necropsies on livestock in order to determine whether the cause of death is due to sickness or other environmental factors that may affect the rest of the livestock. 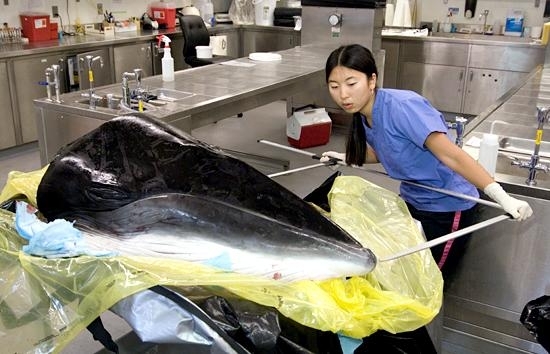 If caught early, we can use the information to prevent or contain outbreaks. 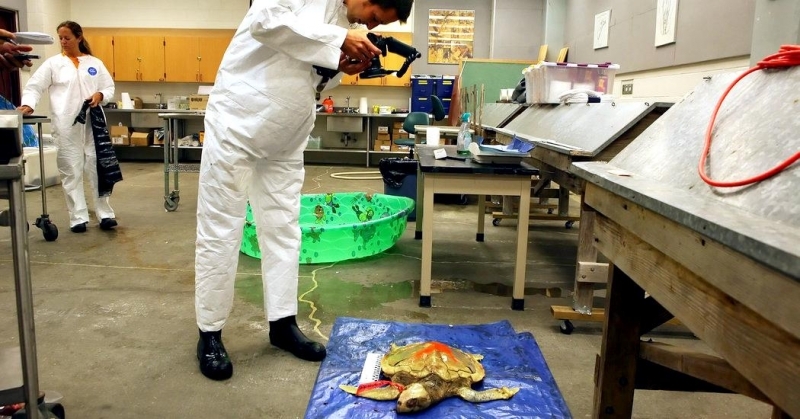 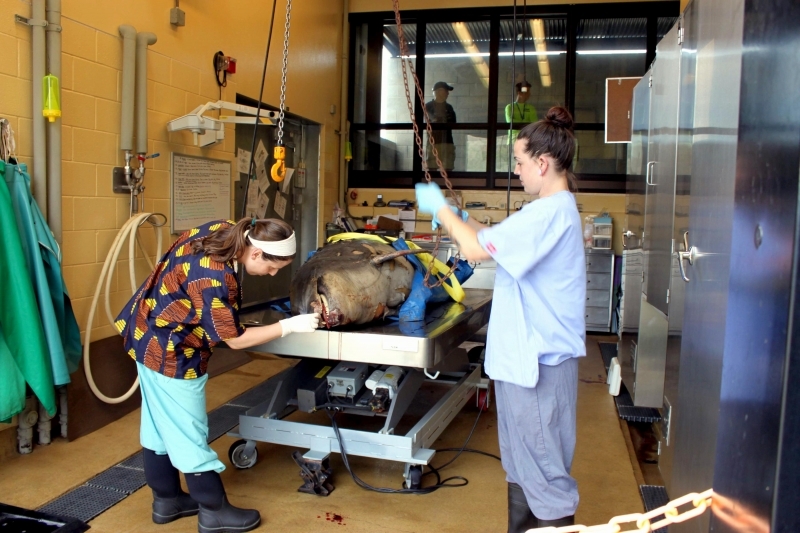 Zoos and other institutions that care for animals also perform necropsies on animals that have died in their care in order to ensure the safety of other animals who may be affected. 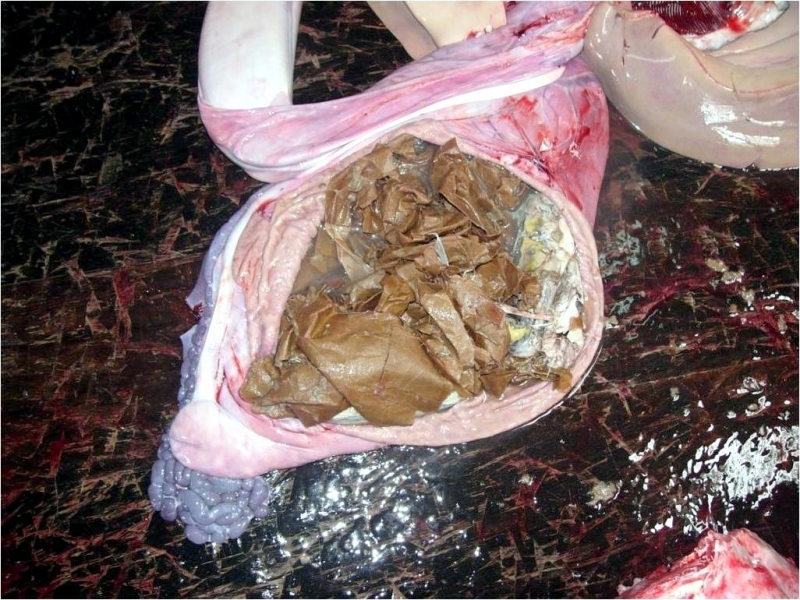 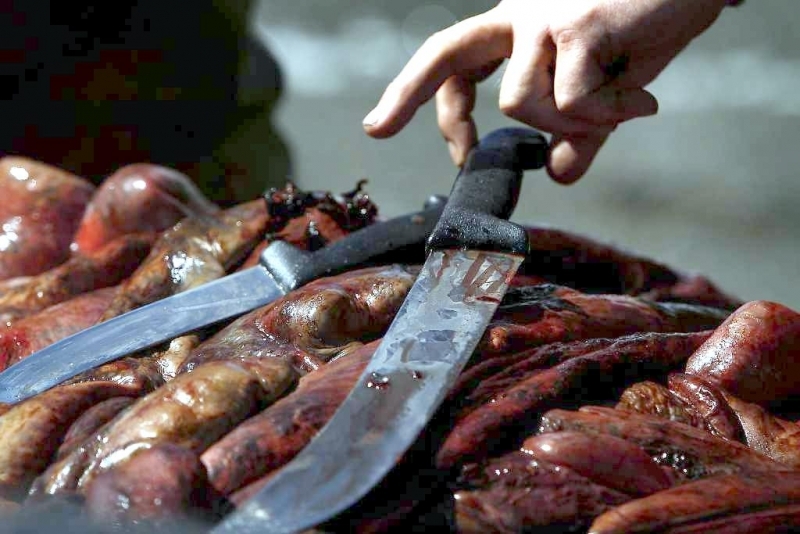 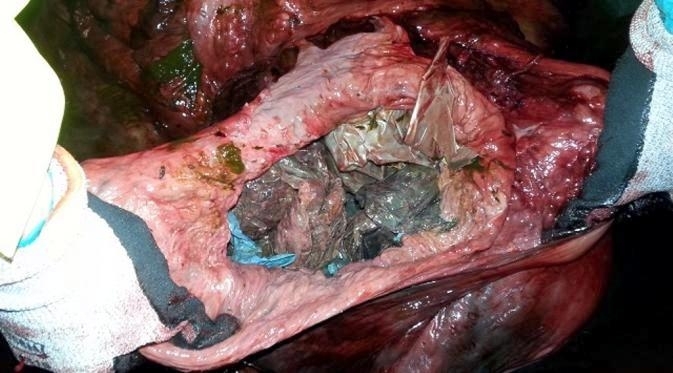 Some of the procedures for a necropsy include collecting samples from one or more of the internal organs, examining the stomach contents and looking for signs of trauma. 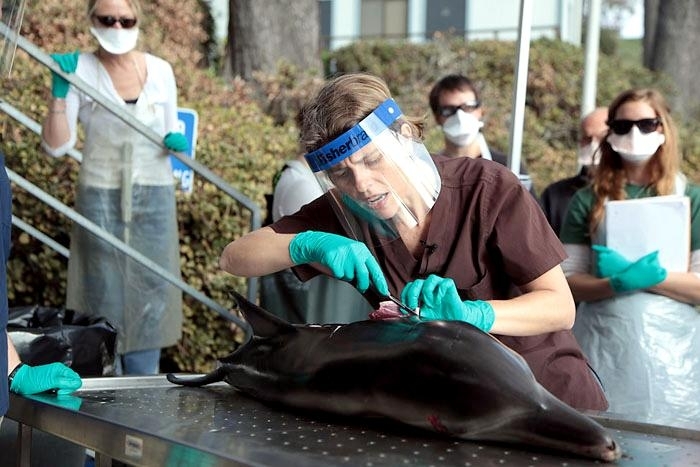 The blood will also be examined in order to determine enzyme values and other factors. 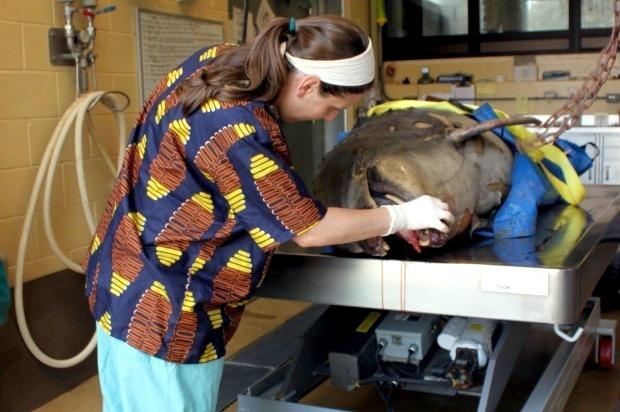 From the necropsy, researchers & veterinarians are able to determine how old an animal is, whether or not a female had been pregnant and what the animal ate. 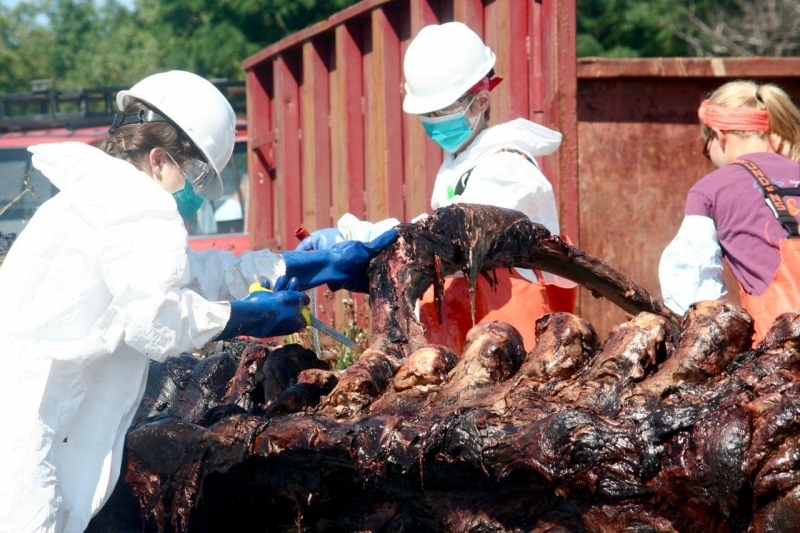 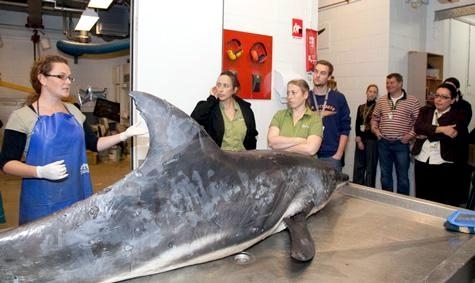 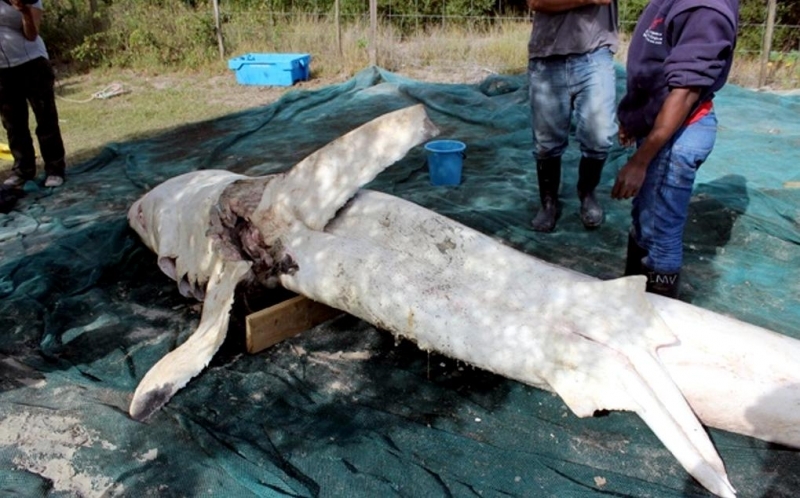 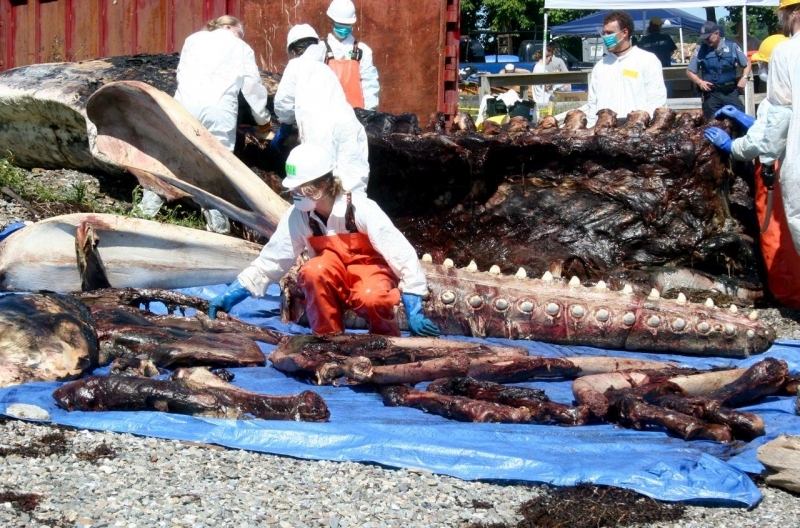 When it comes to whales, skeletons are kept after the necropsy and sent to universities, schools & museums so that the specimen can be studied well into the future. 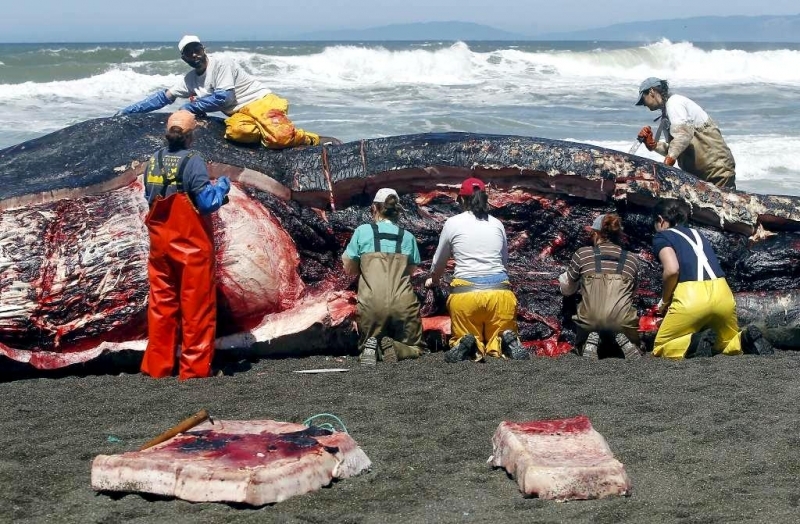 Why do marine mammals strand? 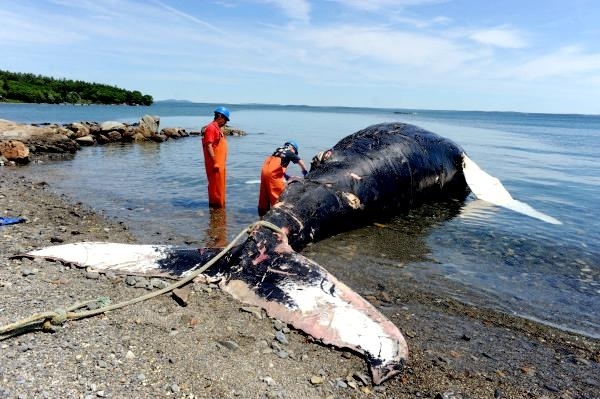 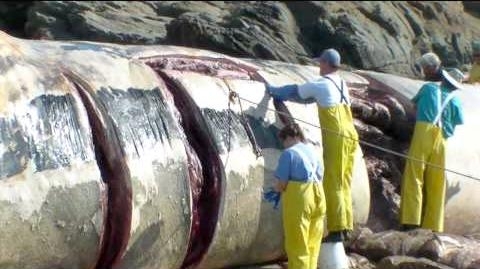 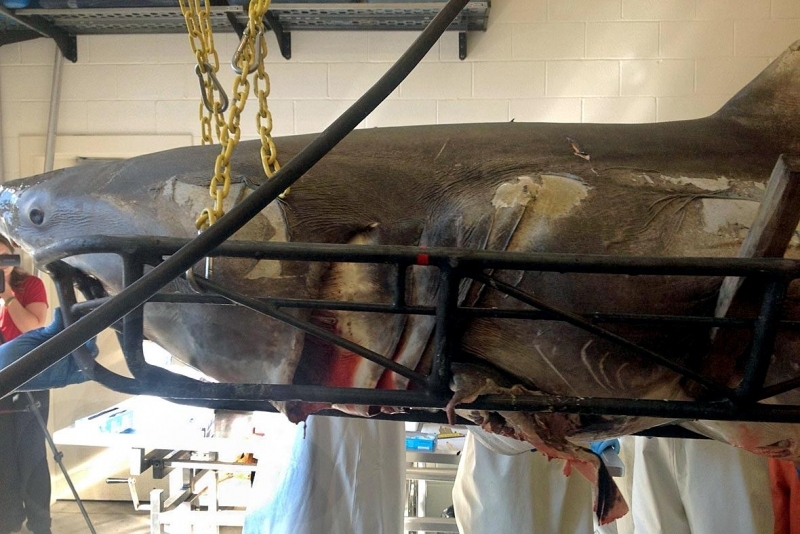 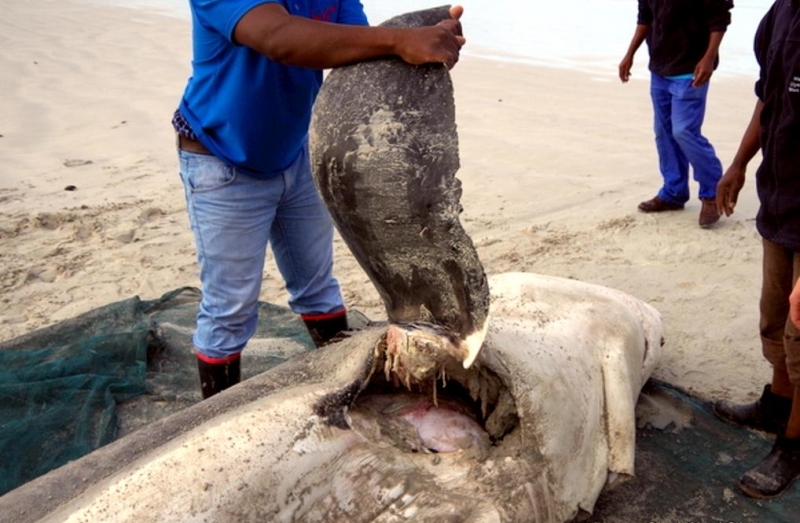 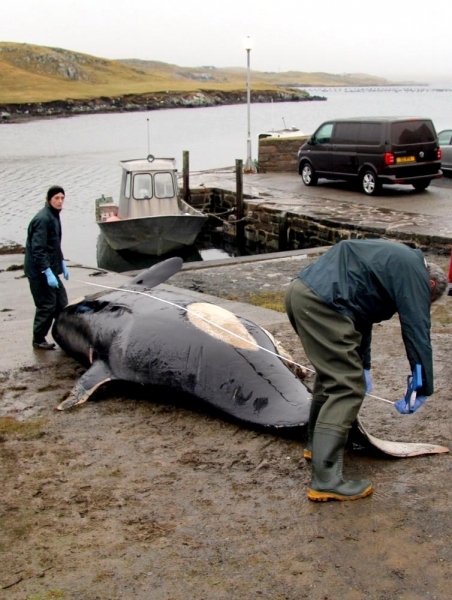 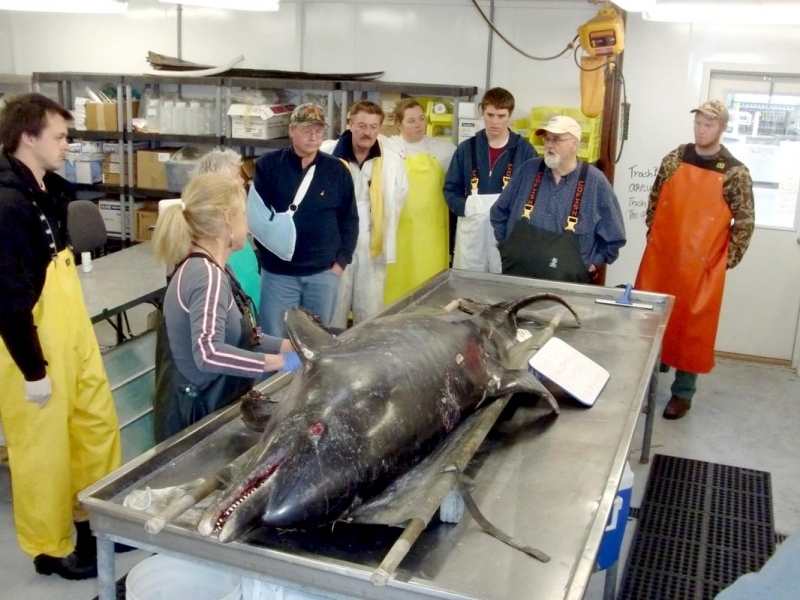 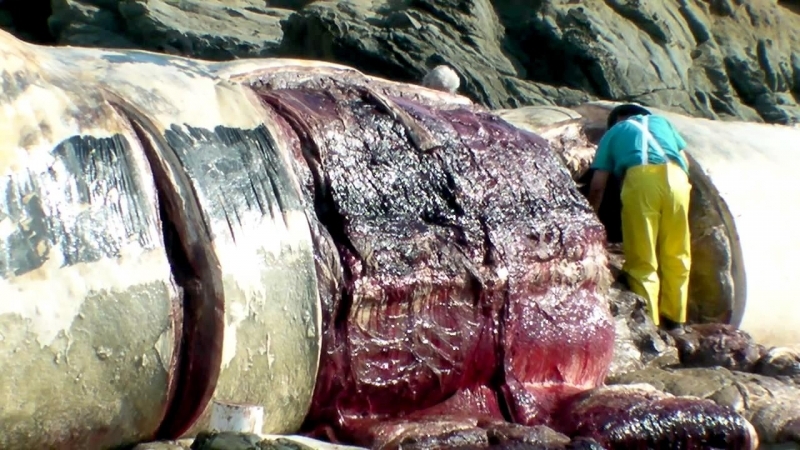 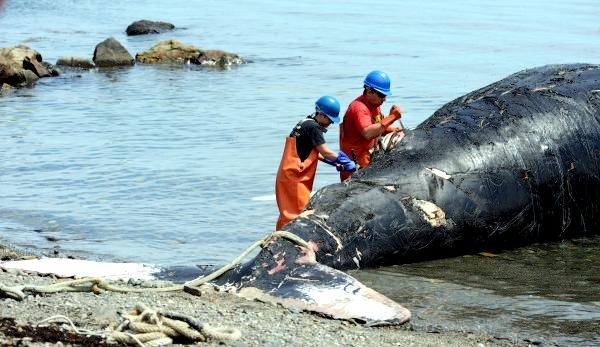 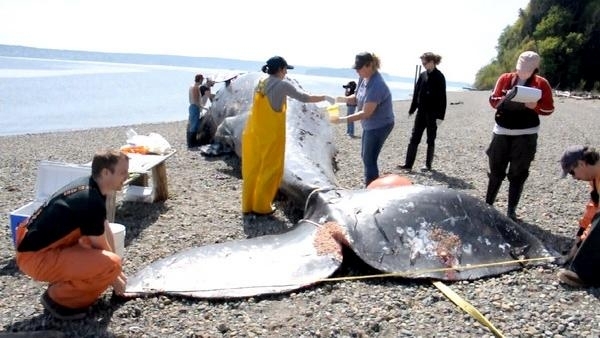 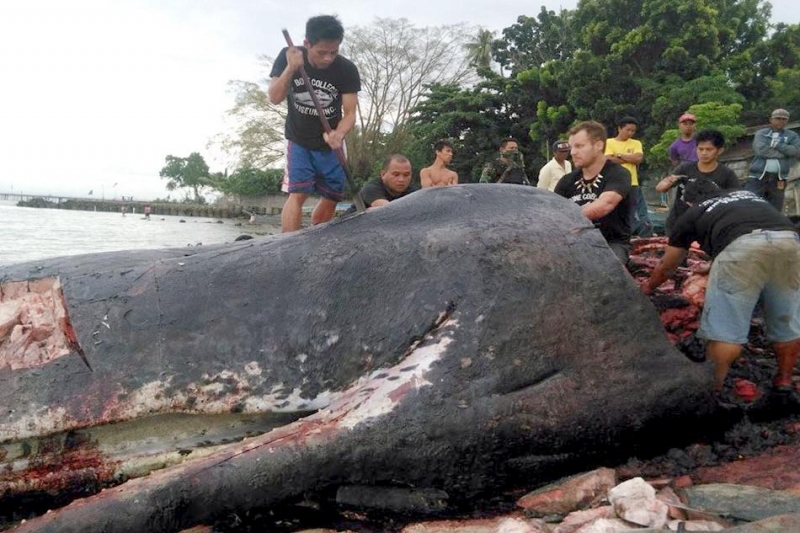 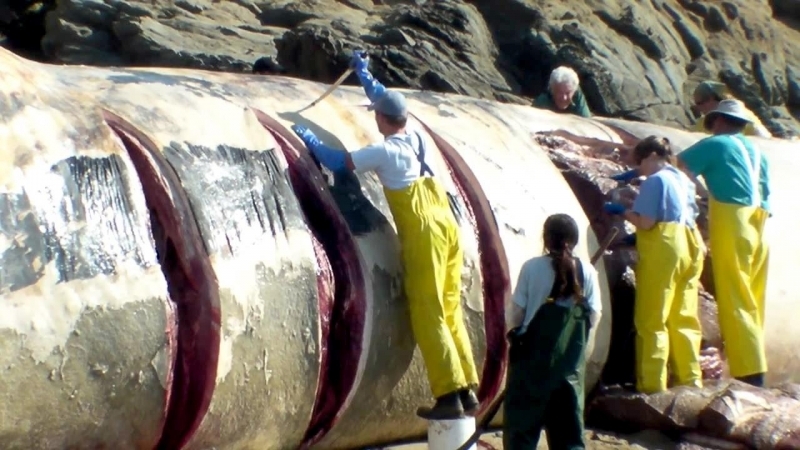 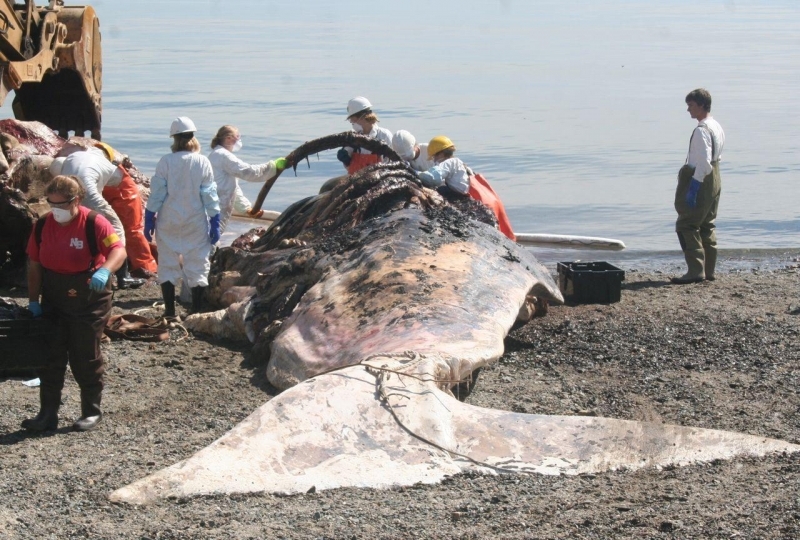 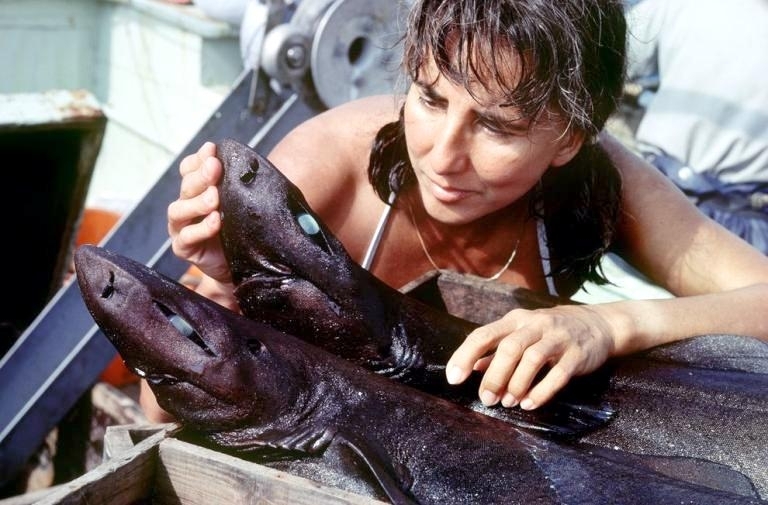 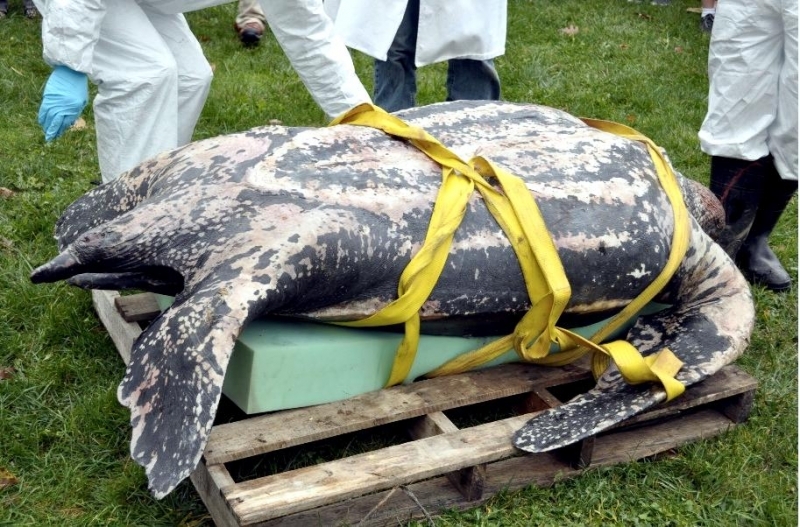 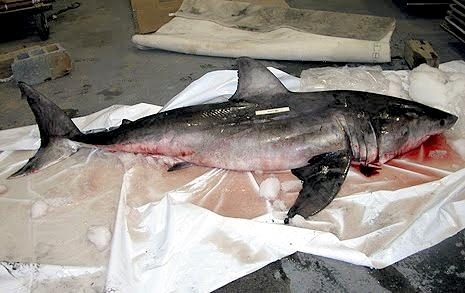 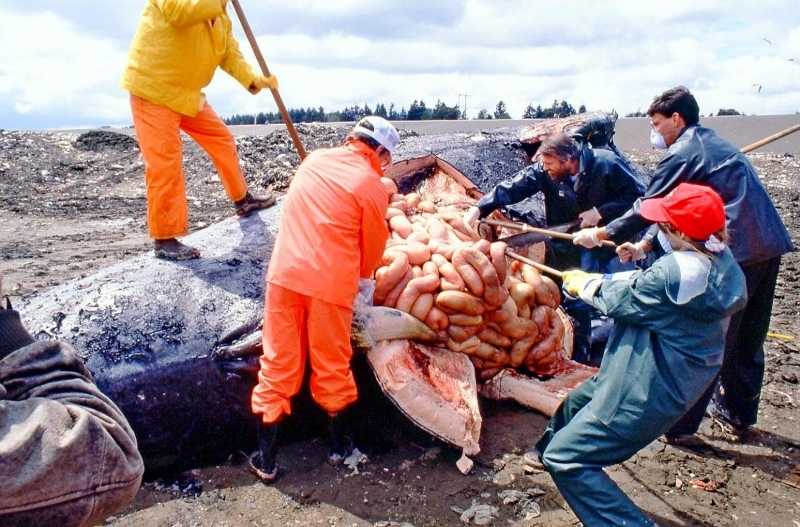 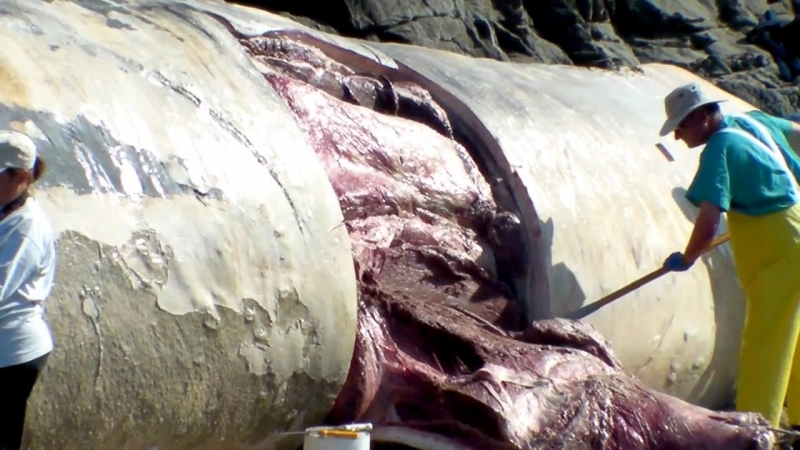 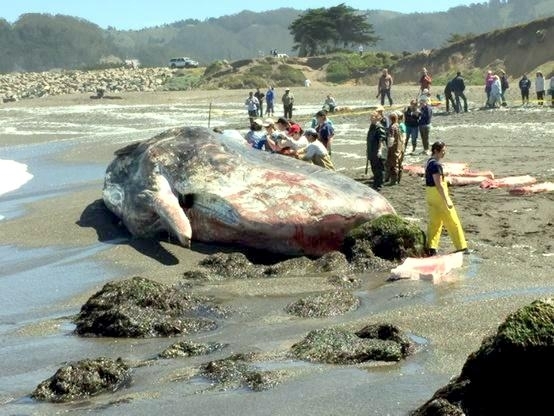 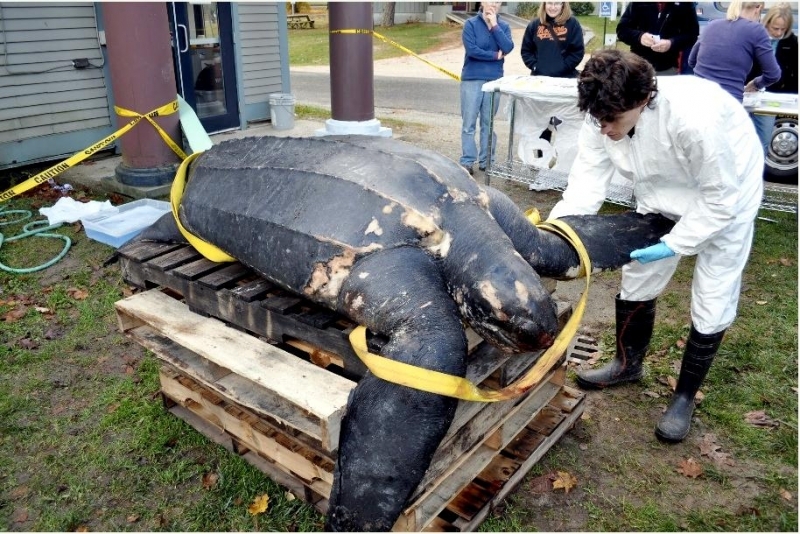 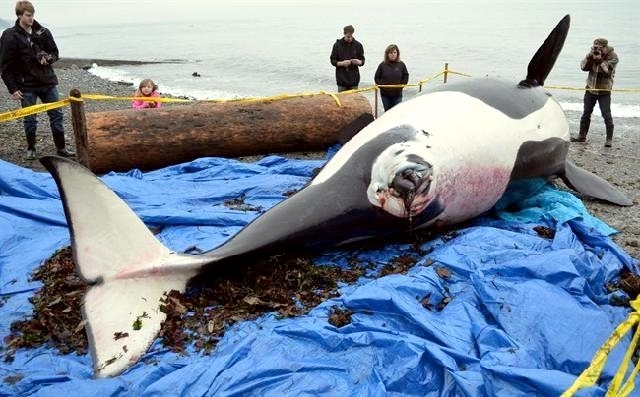 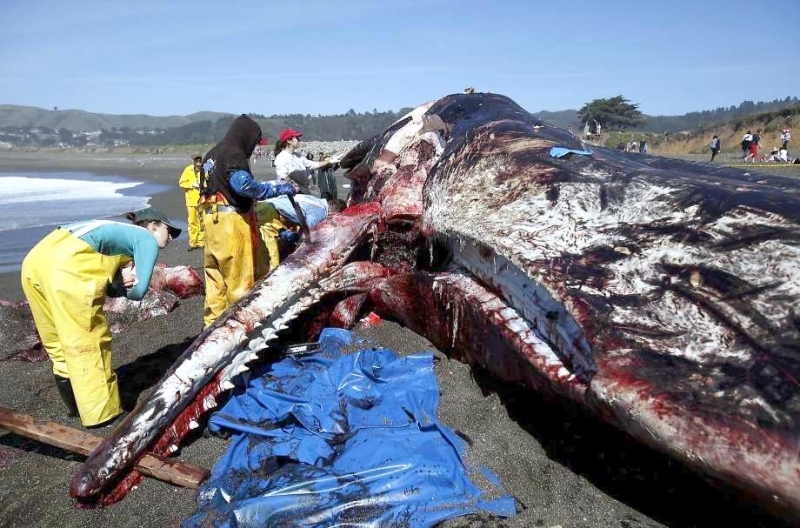 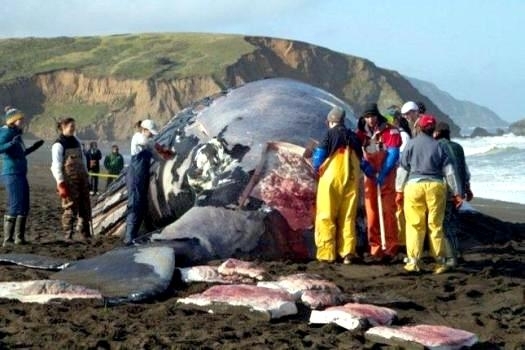 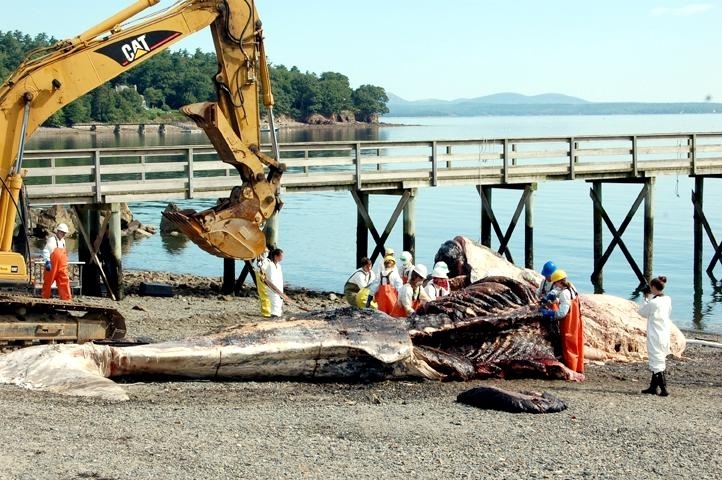 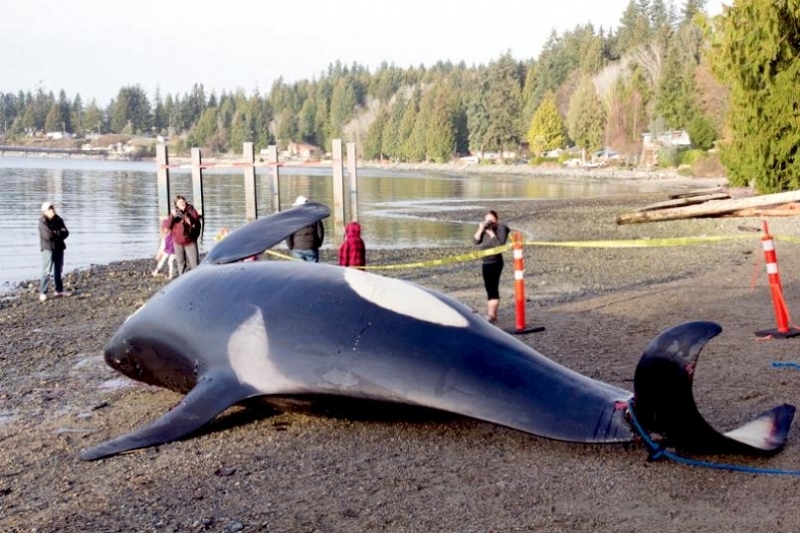 In most stranding cases, the cause of stranding is unknown, but some identified causes include disease, parasite infestation, harmful algal blooms, injuries due to ship strikes, fishery entanglements, pollution exposure, trauma or starvation. 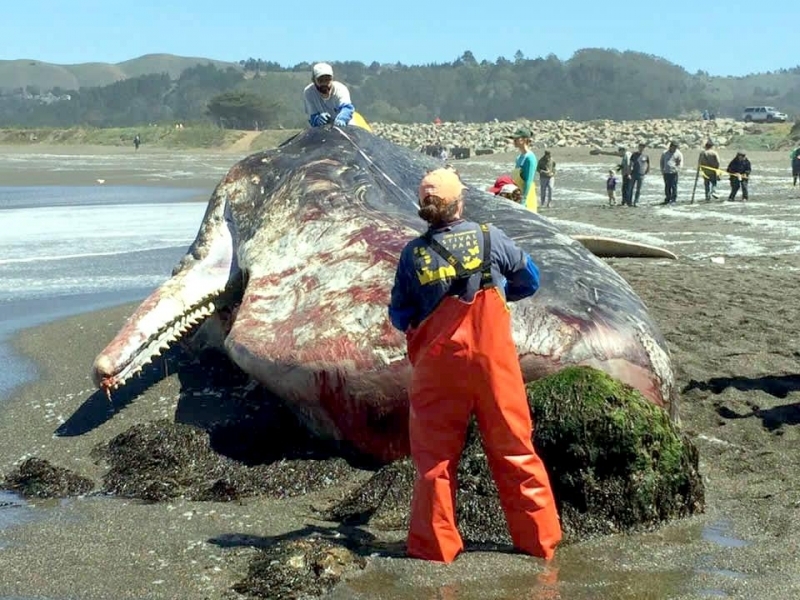 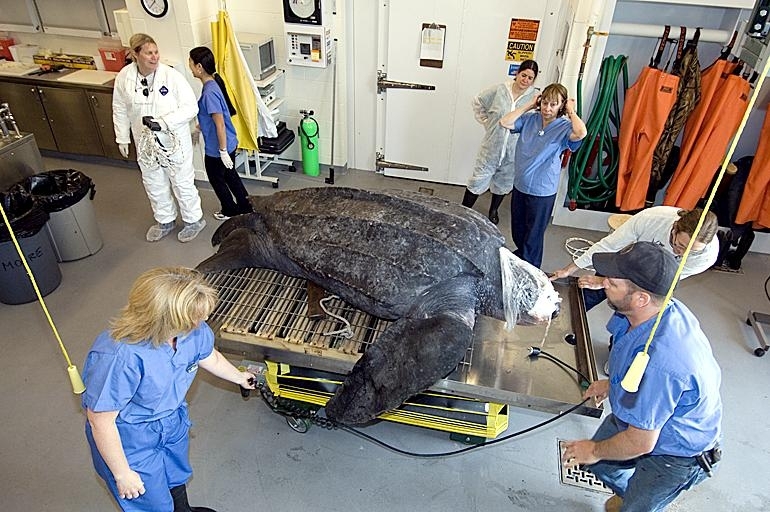 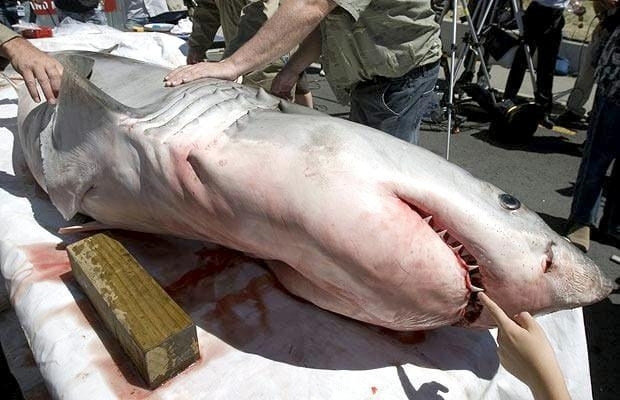 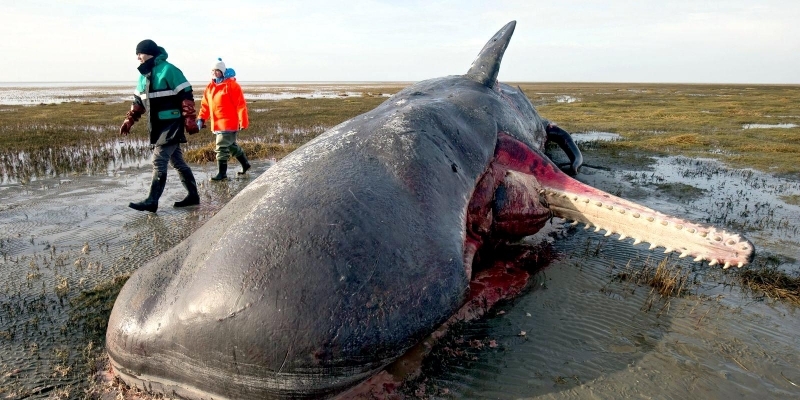 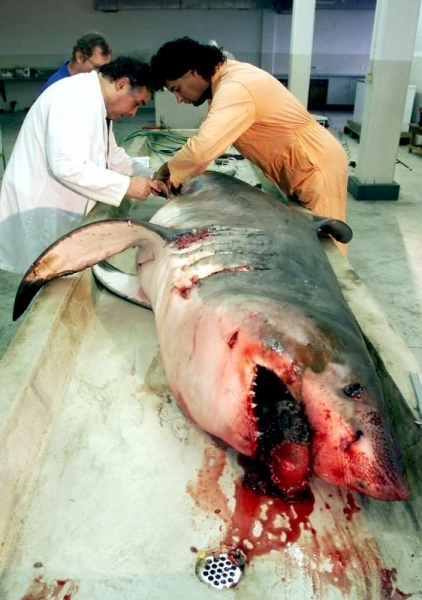 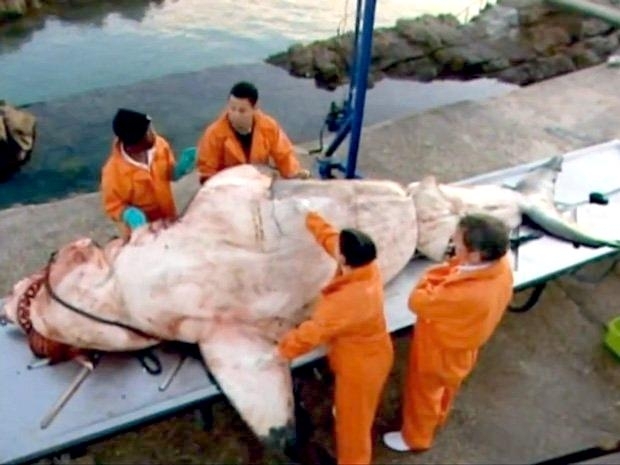 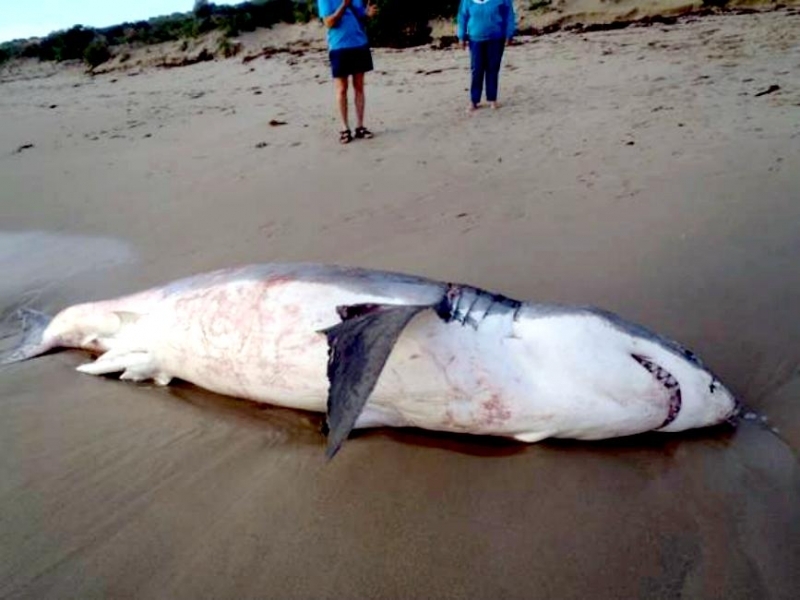 In addition, strandings often occur after unusual weather or oceanographic events. 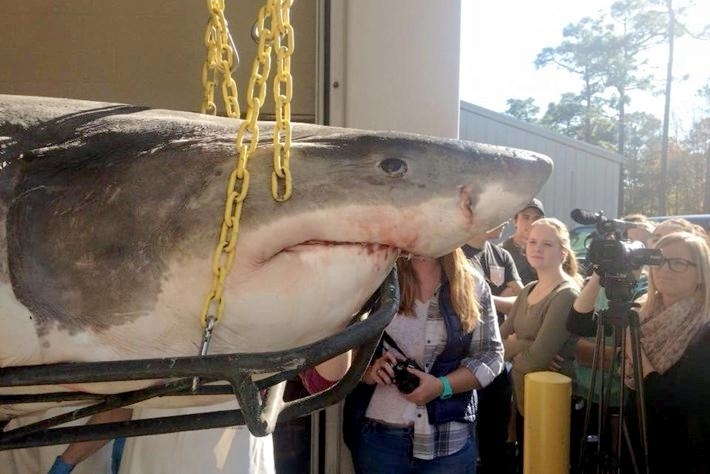 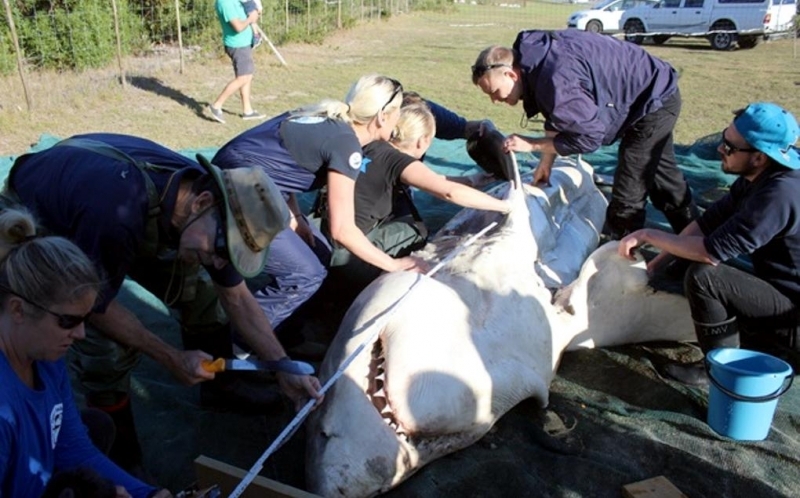 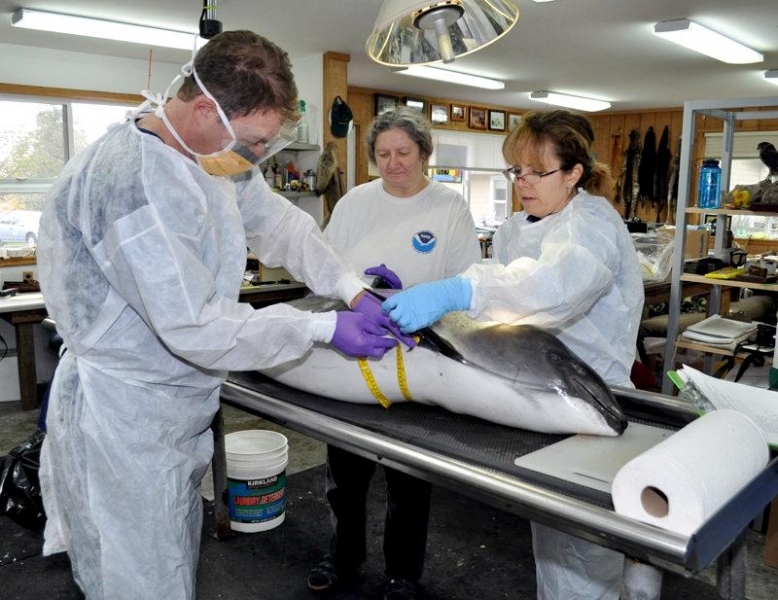 In the past few years, increased efforts in examining carcasses and live stranded animals has increased our knowledge of mortality rates and causes, allowing us to better understand population threats and pressures. 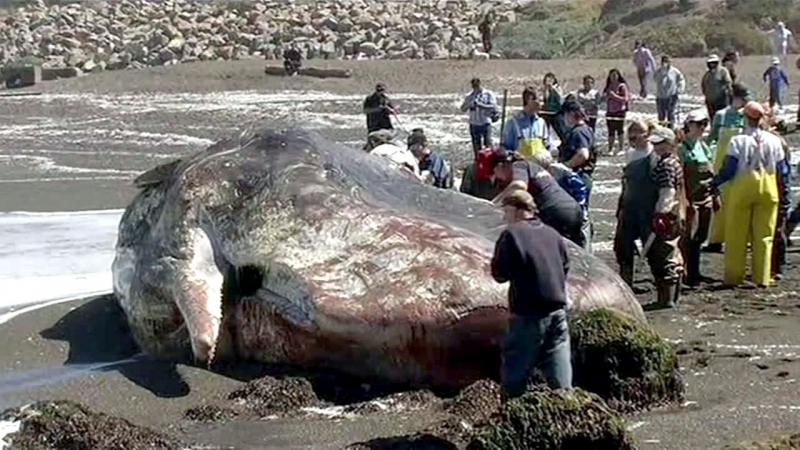 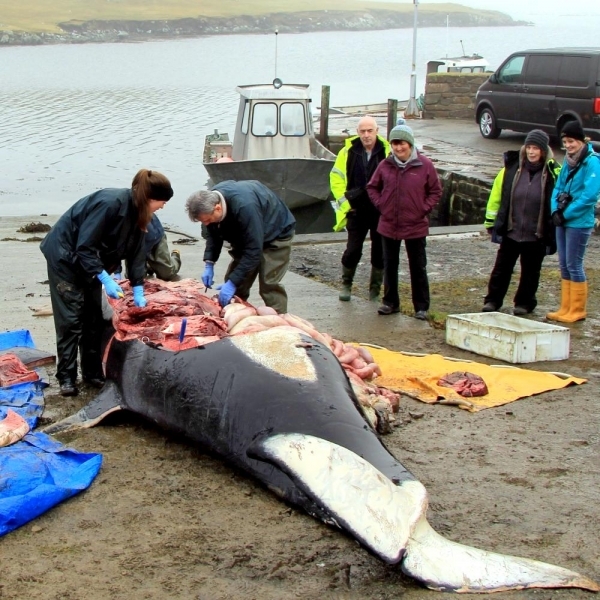 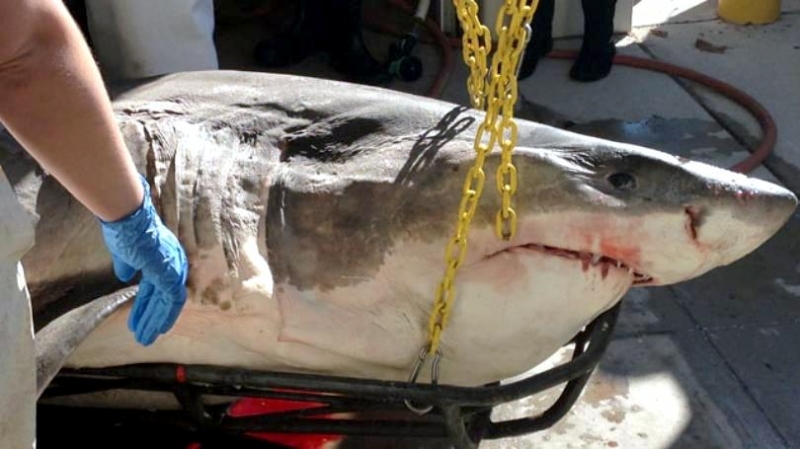 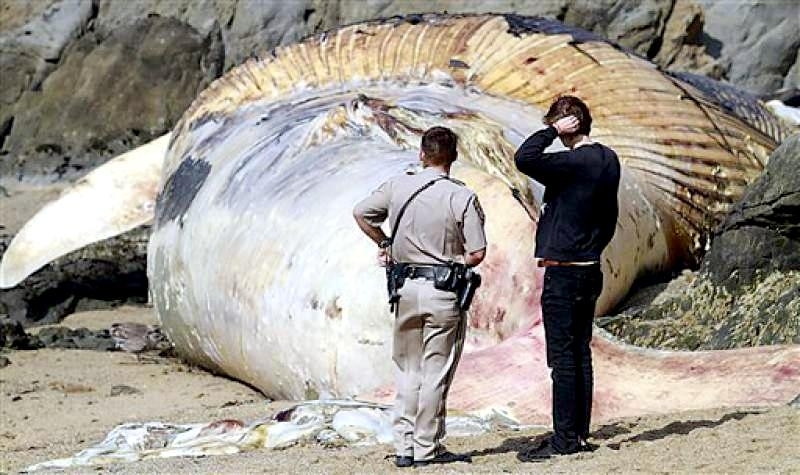 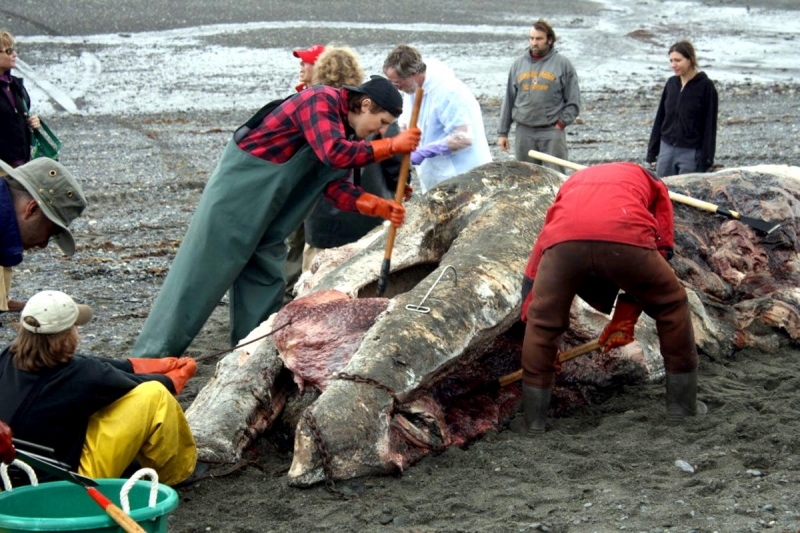 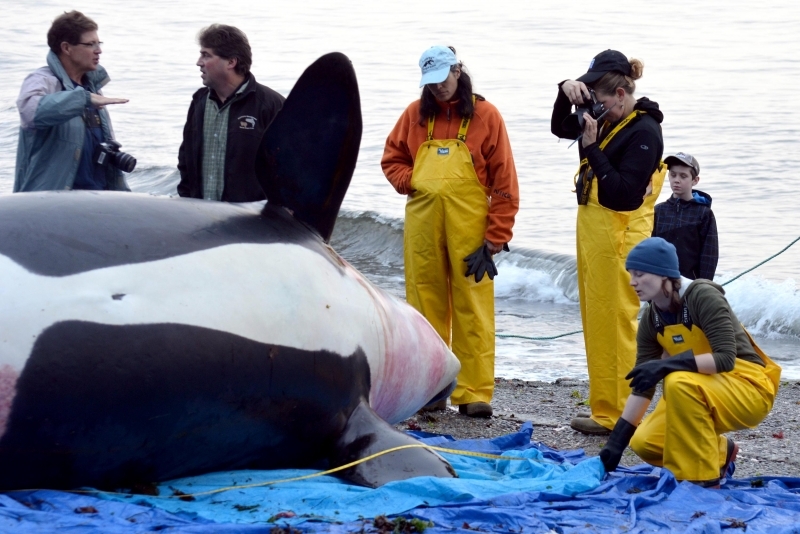 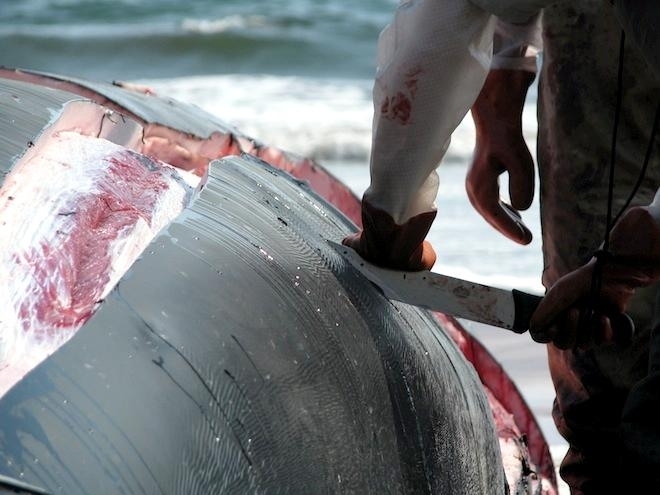 What information is gained from necropsies of stranded marine mammals? 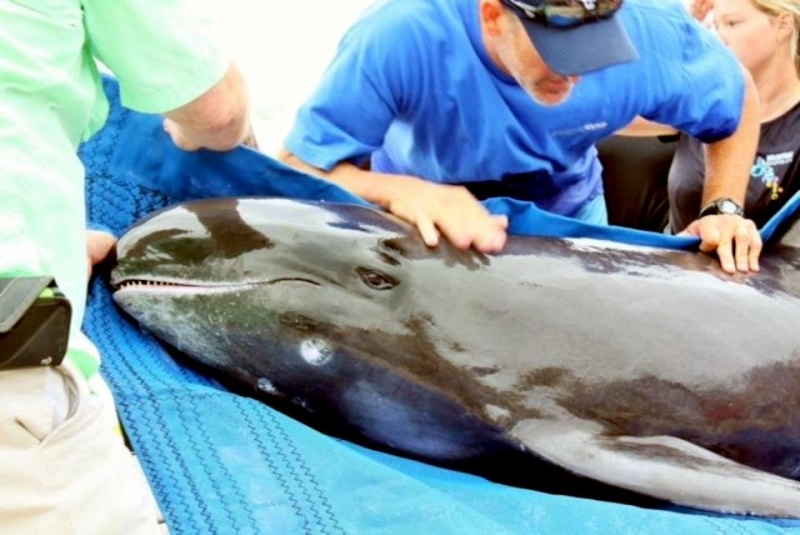 If a stranded marine mammal has recently died, then a significant amount of valuable information can be gained from it. 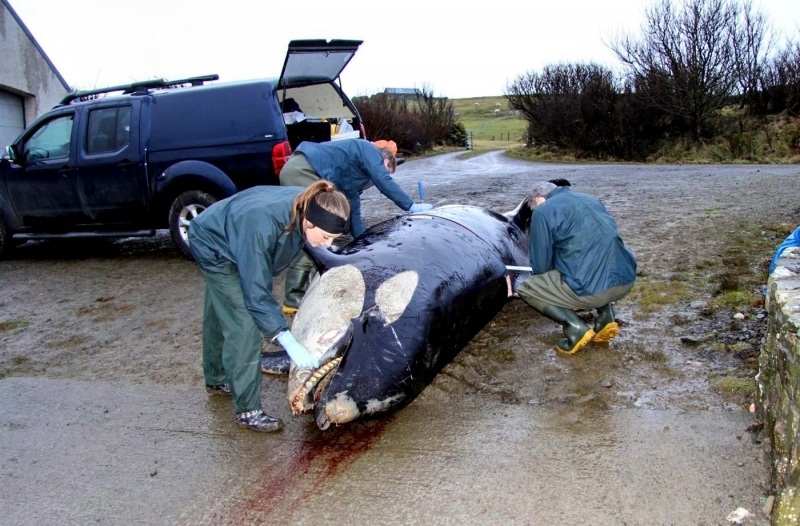 For instance, the complete pathology to investigate diseases and parasites, reproductive biology data, life history (what does the animal eat, how long do they live, how many calves do they have, how old are they when they first reproduce), pollution and normal biology & physiology parameters. 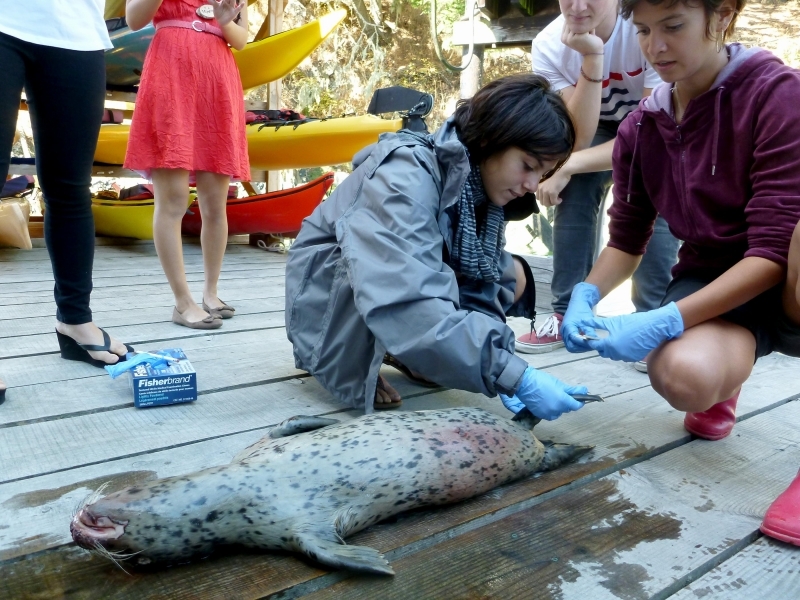 These types of sampling opportunities also help validate and increase understanding & interpretation of data collected from wild populations. 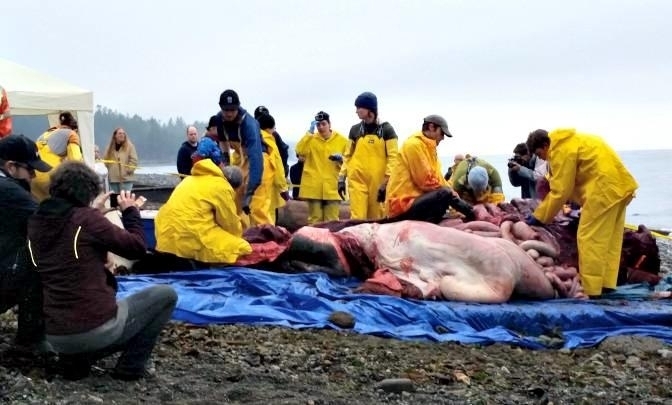 Through necropsies we have learned a significant amount about the basic physiology & biology of animals that are not accessible in the wild or through any other means. 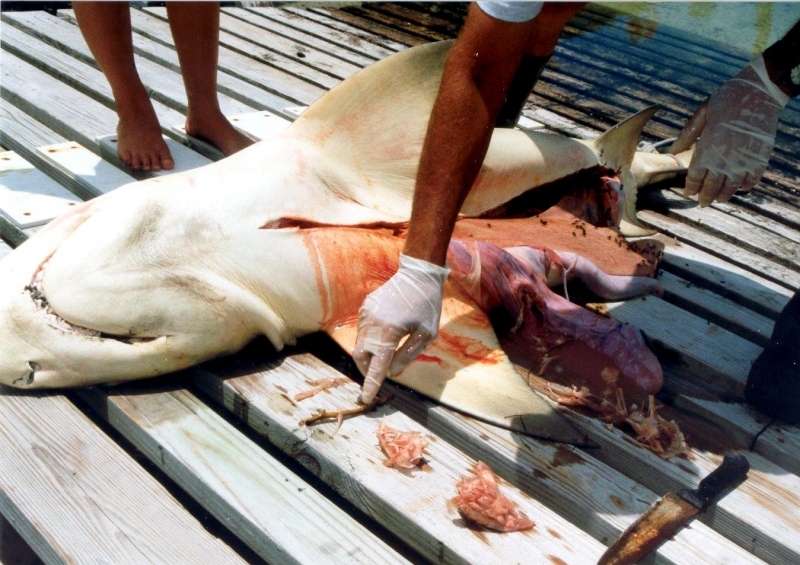 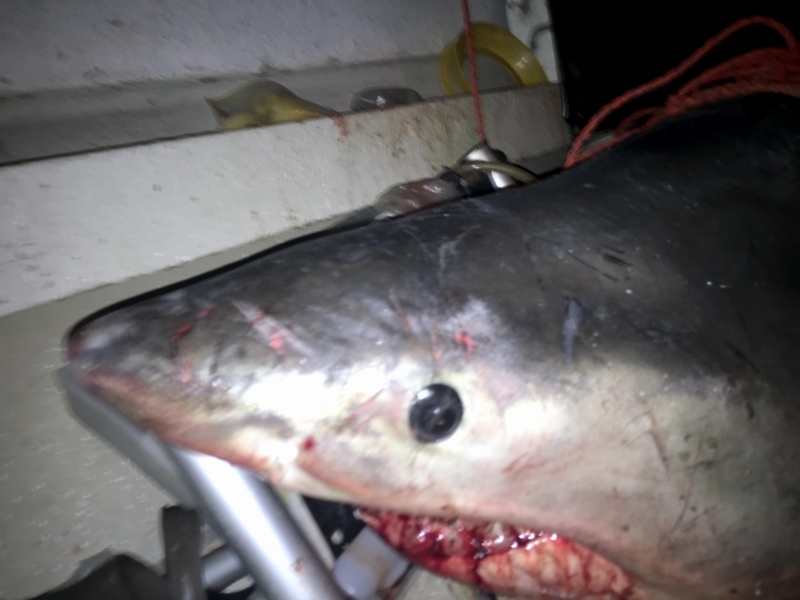 Necropsies have also provided data on the incidence of human interactions including ship strikes, entanglements, hooks and marine debris ingestion. 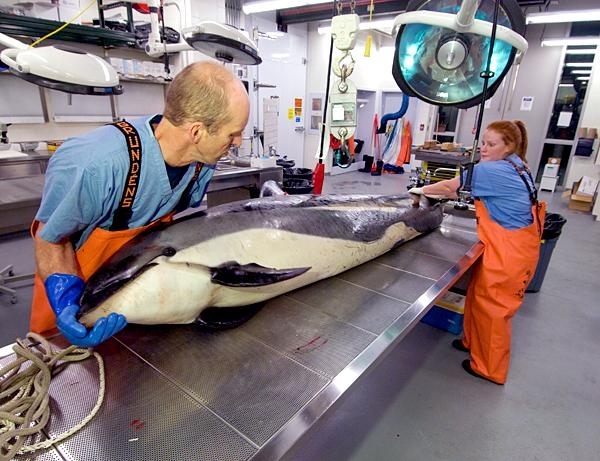 These data help us to make better management decisions about these stocks of marine mammals. 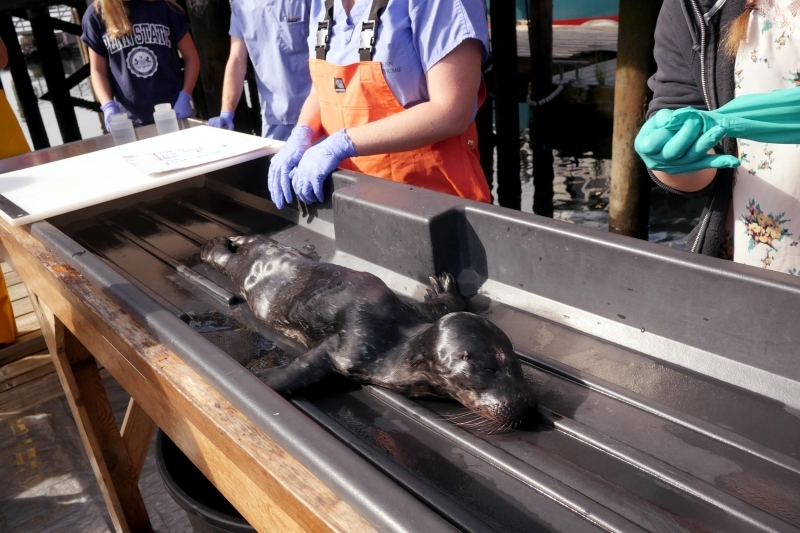 There are currently 32 facilities that can rehabilitate stranded marine mammals under NMFS jurisdiction. 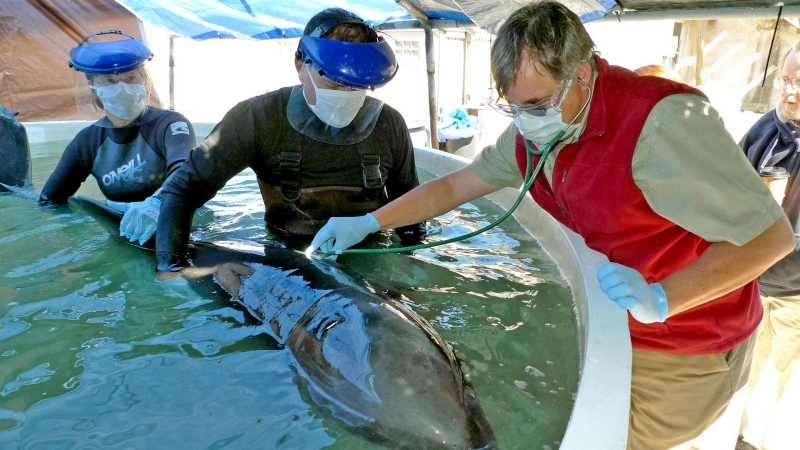 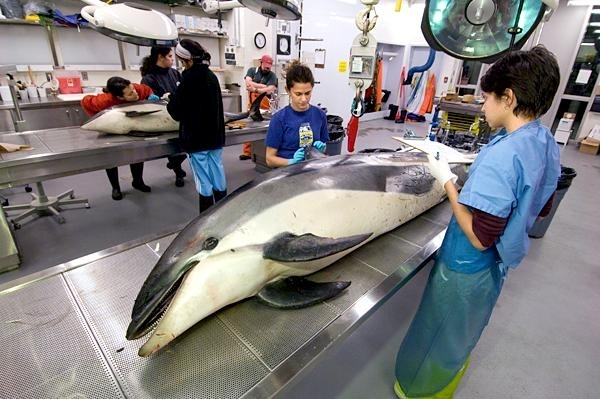 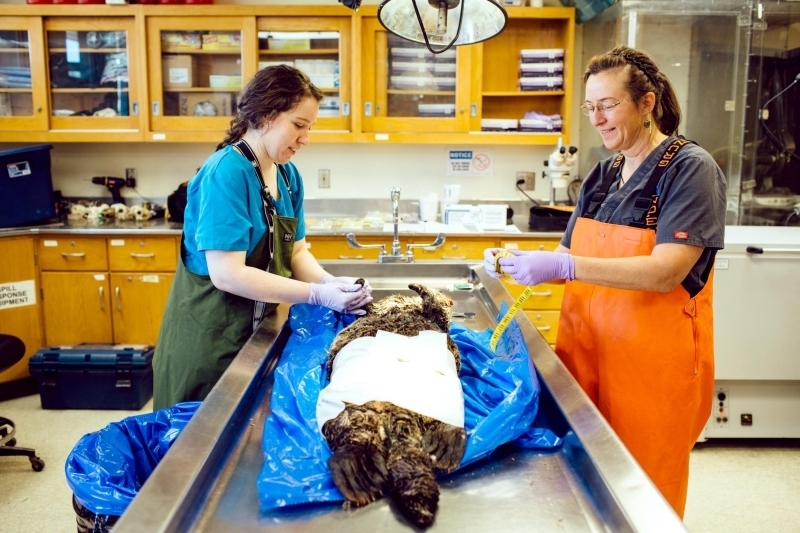 In all, there are over 120 organizations or stranding network participants authorized by NMFS to respond to marine mammal strandings, but only some of those facilities can rehabilitate marine mammals. 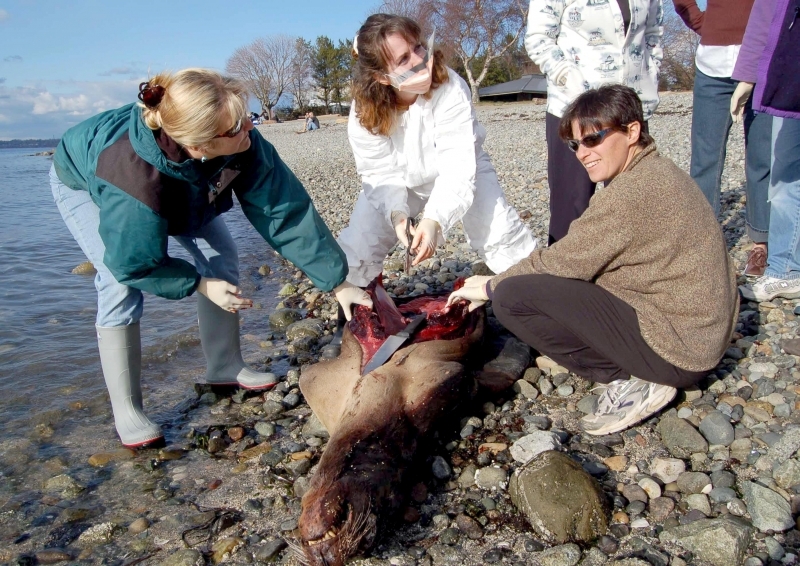 There are many organizations/stranding network participants who are strictly first responders on the beach (i.e., they rescue the animal, but don’t have adequate facilities to rehabilitate marine mammals). 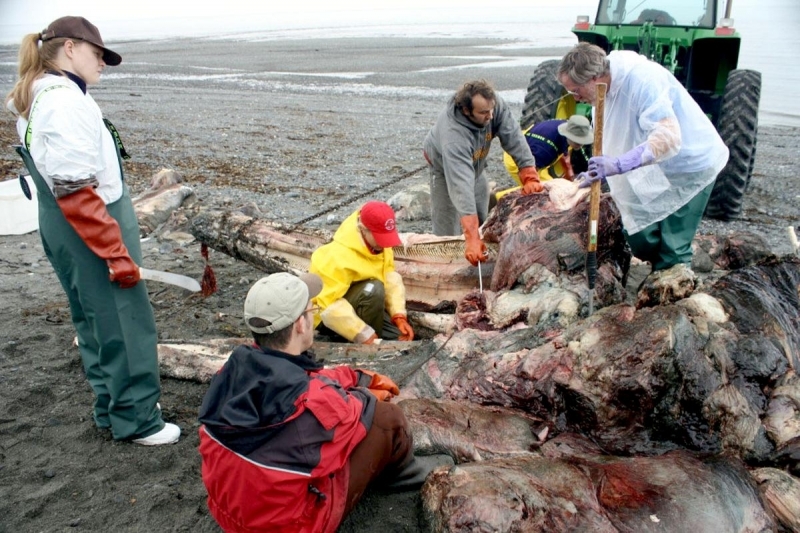 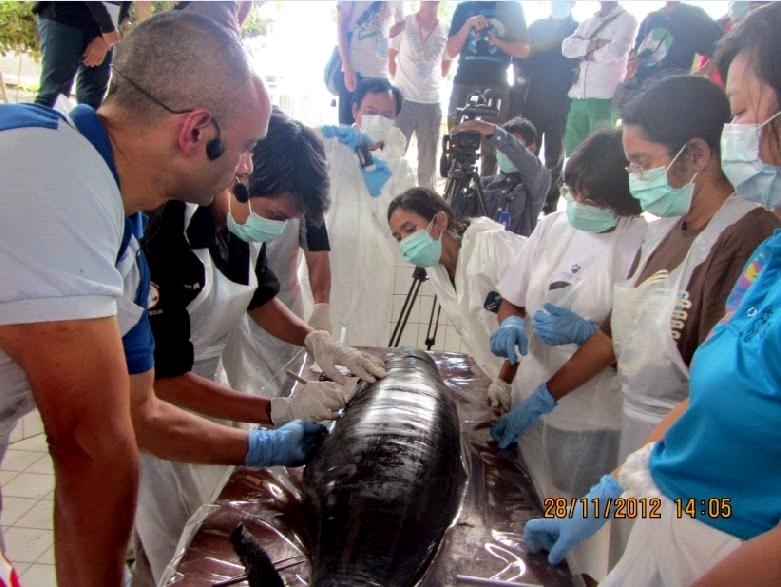 Some network participants respond only to dead marine mammal strandings. 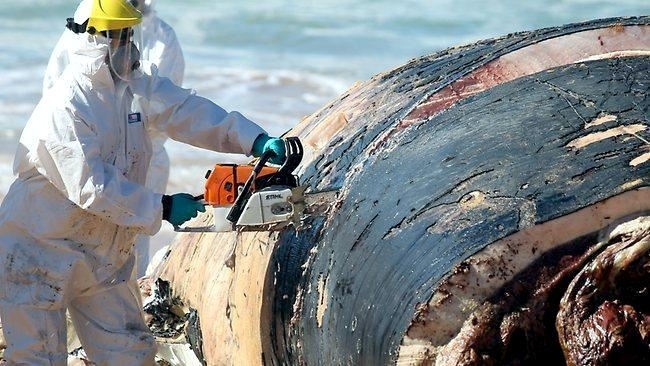 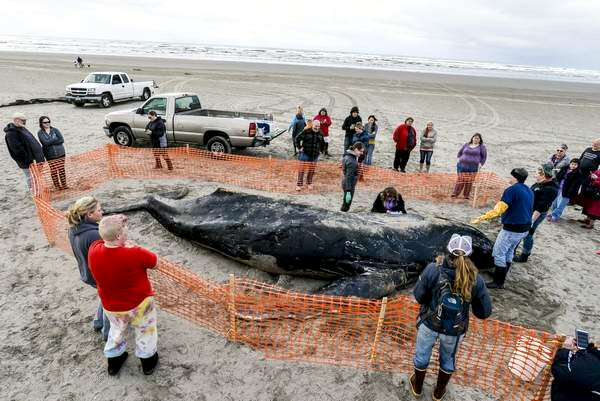 Responders to dead strandings make up the vast majority of responders and may include federal, state and local governmental entities, non-profit organizations, academic institutions, museums, scientists and managers among others.